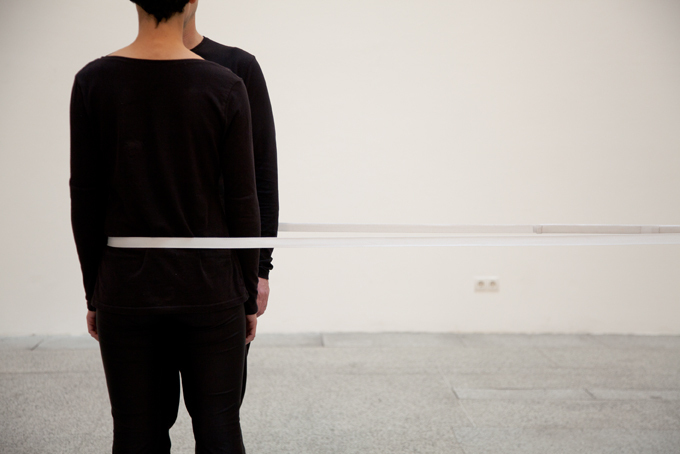 Collaboration #14 is a new performance by Jasmin Schaitl (AT) and William "Bilwa" Costa (US). They are currently developing this work while in residence at Tartu Artists' Union House, as part of Creative Center Carnation/NEELK in Tartu. collaboration #14 (excerpt) is a showing of their work in progress. collaboration is an ongoing series of performances, that address the physical relationship between two artists, while exploring the correlation between, and potentials of: proximity – distance, transformation – alteration, tempo – stillness, duration – ephemerality, and duality – unison. collaboration #14 is supported by Bundeskanzleramt Österreich, The Austrian Embassy Tallinn, and The Austrian Embassy Helsinki. The performance will be followed by an informal discussion with the artists. Jasmin Schaitl (AT) is a live, action-based artist with a visual arts background. She works site-relatively, creating installation environments, where the witnesses‘ perception of space and time is modified through her actions. William “Bilwa” Costa (US) is an artist who works in the performing, sound, and visual arts contexts. He works internationally, generating research, lab, and performance projects, actively cultivating opportunities for artists to work together on new interdisciplinary experiments. In July 2013, Jasmin Schaitl and William “Bilwa” Costa began a collaborative duo. Since then they have performed, led workshops, and have been artists in residence in Vienna, Berlin, Helsinki, Tallinn, Tartu, Oslo, and Istanbul. Their work addresses the physical relationship between two performers while exploring the correlation between, and potentials of: duration - ephemerality, proximity - distance, transformation - alteration, and duality - unison. Additionally, they have worked in trio and group projects including: 三 (3) movement-sound-action with Akemi Nagao, sound/map with Aya Imamura, an untitled video project with Christian Konrad Schröder, and sub_space with Akemi Nagao, Stina Nilsson, Aya Imamura, and Irene Cortina Gonzalez.